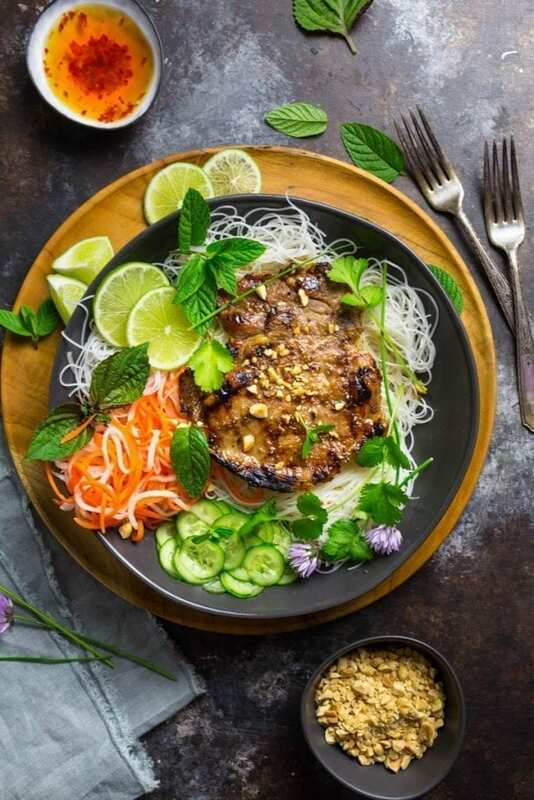 These Vietnamese pork chops are marinated in the perfect balance of lemongrass, garlic, fish sauce and sugar, grilled to perfection, and served with cold rice noodles, lots of herbs and pickled vegetable sides. 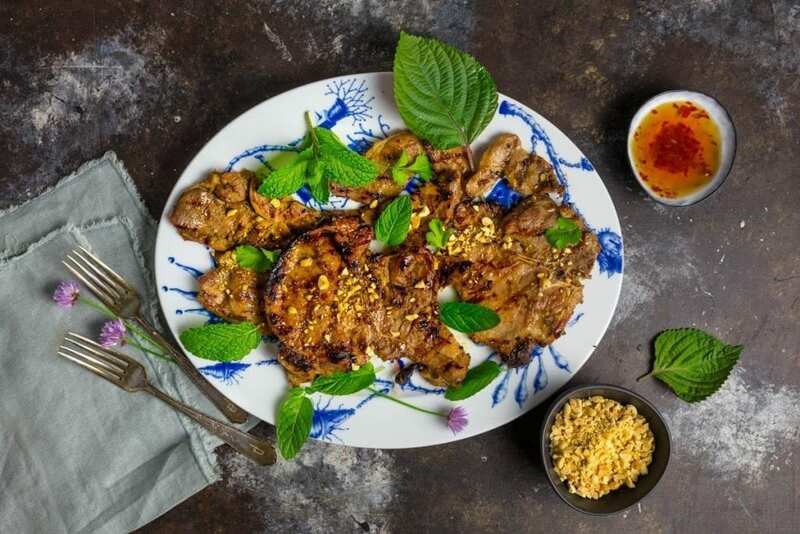 Thit heo nuong xa – grilled pork chops – are a staple in Vietnamese restaurants. But they’re so easy to make that there’s no reason why you shouldn’t bring this classic dish home. 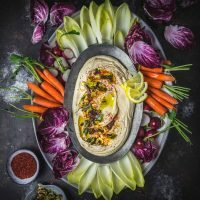 Traditionally, they’re grilled, so we thought it was the perfect excuse to eschew the burgers and hot dogs for one weekend and kick off our summer grilling season with something a little more flavorful. The noodles make it the ultimate refreshing summer dish, almost a noodle salad of sorts. Between the sizzling charred chops, the chilled rice noodles, plenty of fresh and quick-pickled vegetables, and the nuoc cham, a bracing savory-tart dressing, it’s everything you want on a hot day. 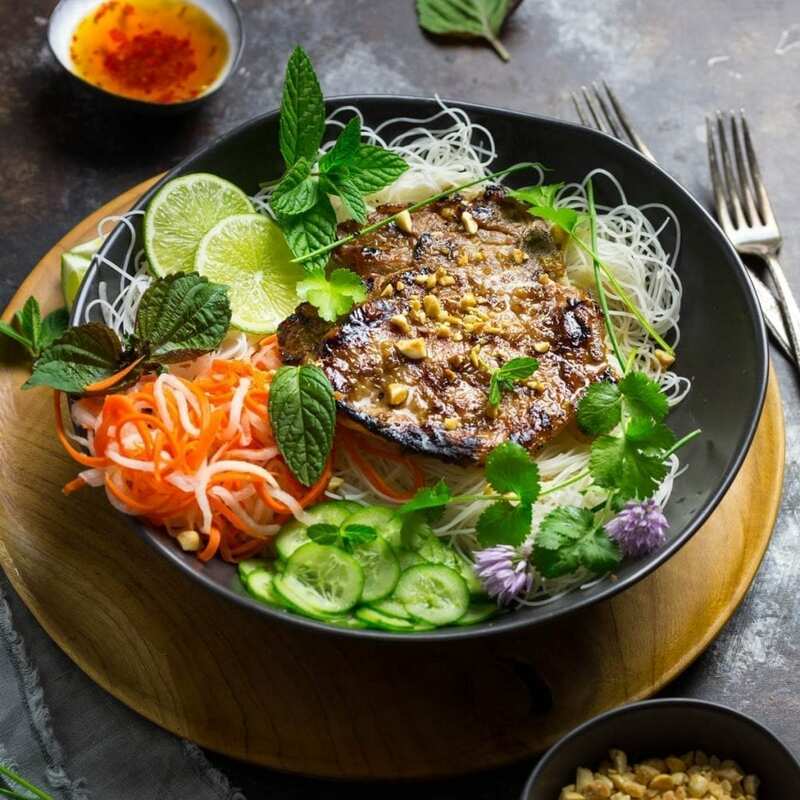 And it’s all about the flavor: the key to this dish is a long marinade using a few ingredients at the heart of the Vietnamese pantry. The first is lemongrass, which we’ve put to good use many a time to infuse a vodka cocktail. Add a good helping of garlic, and a mix of salty fish sauce and sugar (palm is traditional, but light brown works just fine) and you’ve got yourself a marinade. But wait! Let’s take a step back and talk about the meat itself. We tested our two favorite cuts of pork for this recipe: boneless country-style ribs (cut into thin strips) and thin-cut pork chops (preferably blade end). Both have plenty of fat and marbling, which is important to keep them from drying out on the grill (more about our insurance policy to keep this from happening below). Both cuts worked really well, so the choice is up to you. The ribs were extremely tender and juicy, though the chops had a bit more flavor and a fun bone to nibble on. Because these are so thin, there’s a definite risk of overcooking, especially if your grilling temperature isn’t up to scratch. You want a high heat for this, but a lot of standard backyard grills (especially the gas variety) don’t quite have the chops, pun intended. A grill that doesn’t get hot enough will take longer to cook the chops, which could result in a tough piece of meat. Nobody wants that. Luckily, there’s a backup plan. To ensure the pork stays tender, we utilize the same technique we use in our Stir Fried Pork and Noodles recipe: a quick soak in a baking soda solution. Thanks to the alkalizing effects of the baking soda, the pork retains more moisture and tenderness, even as it chars and crisps on its exterior—we want that flavor, but we don’t want it to toughen up the meat while we get there. Note that this won’t work for bigger cuts such as thick-cut pork chops or a roast, because it only affects the surface area of the meat. The baking soda soak only needs 15 minutes (though it won’t harm the meat if left longer), after which the pork should be rinsed and placed in the marinade bag. Refrigerate if you’re marinating it for a few hours (which we do recommend). You can pickle the daikon and carrot mix up to a week ahead, though you can use it right away if you want. And if you’re making your own nuoc cham, get that out of the way, too, although that won’t need any resting time. 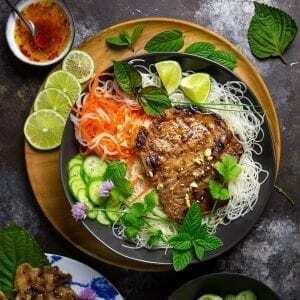 The restaurant version of thit heo nuong xa is most often simply served with rice, but our variation uses cold vermicelli noodles. The main reason: honestly, we didn’t want to do ANY cooking inside. It’s summer and we want to stay outside as much as possible. Also, the combination of hot-off-the-grill pork with cool noodles makes a fantastic contrast. As an added bonus, many brands of rice noodles don’t even have to be cooked: bring a kettle of water to the boil and soak the noodles for five to eight minutes (noodles can vary quite a bit, so follow the package instructions and check for doneness every few minutes), drain and rinse with cold water, and they’re done. If you’re growing herbs, this is a great opportunity to use them. We threw together a mix of our favorites – mint, chives, cilantro and a few leaves of shiso, also called tía tô in Vietnamese cuisine. 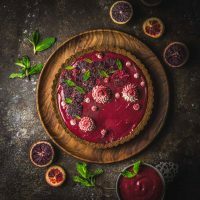 It’s a really pretty leaf that has one green side and one red, and imparts a flavor all its own but that carries notes of mint, anise and celery. If you’re buying herbs, go with mint and cilantro. We also like to add some thinly sliced cucumbers to the bowl, along with a few lime wedges for squeezing over everything. A good drizzle of nuoc cham brings all the elements together (we also like to have a bowl of sauce on the side for dipping). Last but not least, a sprinkle of crushed peanuts adds another layer of texture. As bad luck would have it, halfway through the grilling process, we were hit by a belter of an early-summer storm that brought our outdoor cooking to a premature close. Not to worry, though – a few of the chops were easily finished on a stovetop grill pan. 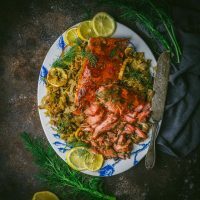 Yes, despite our best efforts, the stove got used after all – and of course you can accomplish the whole cooking process this way if you’d prefer. Go for a ridged pan or griddle if you can, and get it as hot as possible (a pre-heated cast iron pan is ideal) so as to get that delicious char on the pork. Throw it over the noodles, and have fun with the sides. Because whether or not your grilling weather co-operates, this is a recipe where it all comes together in the end. For the Pork: In a large zipper-lock bag, combine baking soda with ½ cup (120ml) water and swish until baking soda is dissolved. Add pork, press out air, and seal bag. Refrigerate for 15 minutes. Drain pork, rinse under cold running water, and pat dry. Rinse zipper-lock bag and reserve. Add lemongrass, shallot, garlic and palm sugar to a food processor and pulse a few times until it becomes a rough paste.Transfer paste to a bowl and whisk in fish sauce, soy sauce, corn starch and vegetable oil. Add pork, turning pieces to coat all surfaces. Transfer pork to a gallon-size zipper-lock bag, press out the air, and seal bag. Marinate at room temperature, turning pork once or twice, for at least 30 minutes or transfer to refrigerator and marinate for up to 12 hours before proceeding. Light one chimney full of charcoal. When all charcoal is lit and covered with gray ash, pour out and arrange coals on one side of charcoal grate. Set cooking grate in place, cover grill, and allow to preheat for 5 minutes. Alternatively, set half the burners on a gas grill to the highest heat setting, cover, and preheat for 10 minutes. Clean and oil grilling grate. Grill pork directly over high heat, turning frequently and shifting to cooler side of grill if there are excessive flare-ups, until pork is charred and just cooked through, 3 to 4 minutes total. Assemble serving bowls with noodles, pork, herbs, pickles and peanuts. Drizzle everything with Nước Chấm. Your recipe slips the baking soda steps. Listed as ingredient but it’s not clear what to do with it. This was a big hit with our guests when we made it last summer. The noodles were challenging, though. Simply soaking in hot water did not soften them. Package directions were in several languages, none I could read. Had to fire up the stove and cook for a while delaying the meal a bit. We had plenty of cocktails to tide us over so it was no big deal. I recommend anyone trying the recipe to get familiar with the particular rice vermicelli they have and what it takes to soften it. Should not be al dente like a good spaghetti, but much softer. Have gotten way far behind on checking in and sharing… this looks incredible! Pinned. Hope you guys are doing well. Looks divine!! I am so making this next weekend for special dinner party. Perfect!! Thanks for this, much appreciated. Love your serving bowl/plates too. Do you remember where you got those? Thank you Judi! The dark bowl are West Elm (I think the style was called Scape and the color is cocoa). The blue and white platter is a fancy piece we got for our wedding. I think the design is called Etrange Vegétation. Good luck with your dinner party! 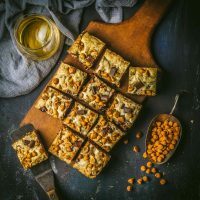 This recipe and pictures are copied from this website. What is the ratio of baking soda to water for the solution?